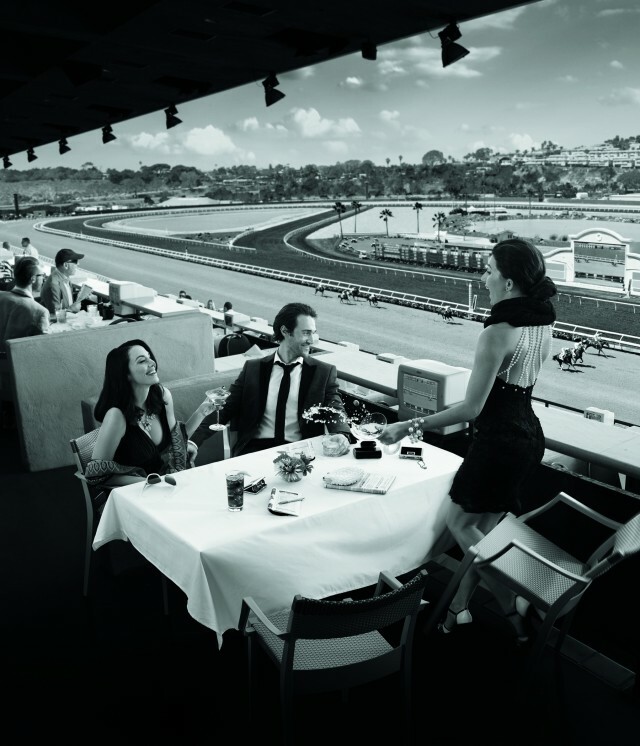 Sit in style or hug the rails for great views all around during the new fall racing season at Del Mar. With the recent closing of Hollywood Park racetrack in Los Angeles, an opportunity for more racing at the historic Del Mar Racetrack opened up on the West Coast circuit. Del Mar has hosted a summer season since 1937 when Bing Crosby stood at the gate and collected the first ticket for admission. It’s been a San Diego summer tradition ever since. 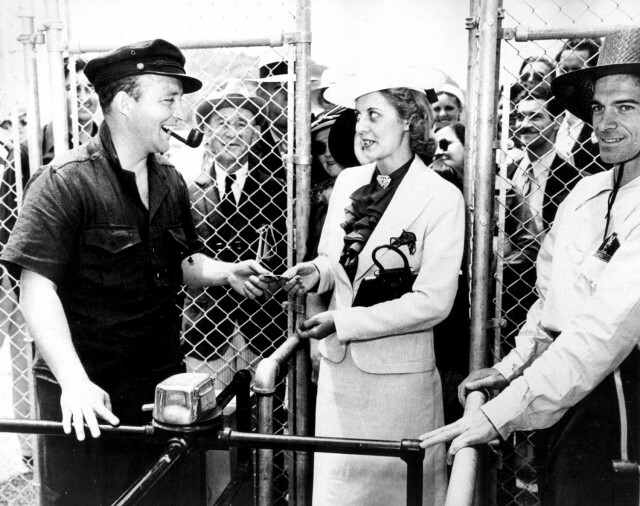 Bing Crosby, one of the founders of the Del Mar Racetrack, takes the first ticket on opening day, 1937. Ironically for my family, thoroughbred racing and Thanksgiving go hand in hand. My relatives would spend Thanksgiving afternoon at Bay Meadows racetrack while my Nana Rose stayed home and cooked the turkey. It was a way to keep us out of her hair while she prepared the big meal. All my relatives had a blast at the rails watching the ponies run. So today, San Diego families have a similar opportunity to enjoy the delicious fall weather near the coast, the excitement of live racing, and even a one mile family fun run on the actual track, followed by a delicious family meal together. It’s a recipe I can recommend. The added season pays tribute to the glamour and excitement of 1930s when Hollywood icon Bing Crosby founded the track with some of his celebrity pals. The Bing Crosby Season will run a total of 15 racing days – primarily Thursday through Sunday. Dress up movie star style on opening day to participate in the Vintage Hollywood Fashion Contest. The season kicks off on Friday, November 7 with a “Vintage Hollywood Fashion Contest,” including awards for Best Dressed Couple, Best Celebrity Lookalike and Most Glamorous. Del Mar is known for its exciting lineup of concerts, food and beer festivals, and giveaways – and the Bing Crosby Season continues that tradition and adds in Football Sundays, when fans can take in a day of racing and NFL action in Del Mar’s Paddock Football Lounge. Multiple TV screens, bars and food options will keep racing and football fans happy all day. Race-goers can enjoy Reggae Fest featuring Iration on the 15th and alternative rock band CAKE closing out the season on the 29th. Food trucks are back Saturday, November 22, along with a plush black and gold diamond blanket giveaway. November 29 will feature a craft beer and cider festival, a Movember event and the biggest race of the meet – the Hollywood Derby. Closing Day – Sunday November 30 – is a free day. Racing during the Bing Crosby Season will take place Friday through Sunday during the first week; Thursday through Sunday the other three weeks. Weekday post time will be 12:30 PM, 12 noon on weekends. The one exception will be Thanksgiving Day, November 27, with first post shifted to 11:00 AM. Admission is $6. This entry was posted in Golf & Sports and tagged north county coastal by Sarah Weinberg. Bookmark the permalink. thank you thank you, a lovely reminder of such happy times.